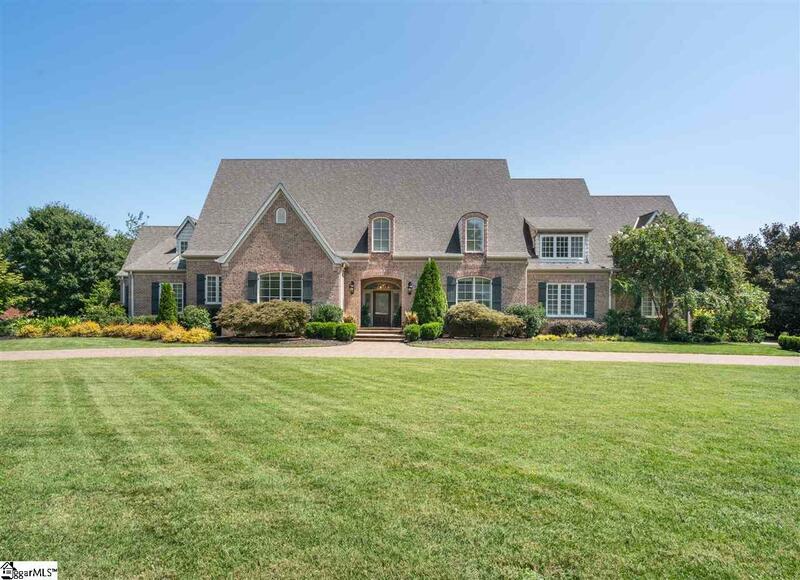 Stunning all brick home situated on 2 well-manicured acres. This home features 4 bedrooms, 4 full and 1 half bath. Welcomed by a spacious foyer and large, formal living room with gas fireplace and beautiful built in cabinetry. 10ft tall ceilings, crown molding and hardwood floors throughout. Separate formal dining room that leads into chefs kitchen with built in refrigerator, granite countertops, gas range, wall oven, and ice maker. Keeping room with gas fireplace leads out to enclosed porch with views of pool area. Master on the main includes oversized his and her bathroom with large tiled shower, jetted tub and separate walk-in cedar closets. Upper level has a private loft area and 3 additional bedrooms each with their own private full bath. Outdoor living space is perfect for entertaining and complete with a covered patio, grilling area, fireplace and pool house. Pristine landscaping with a large fenced yard, outdoor lighting and 3-car garage with extra storage. This home is also equipped with a generator. Located just 10 miles from downtown Greenville, this home truly has it all! Schedule your appointment today!